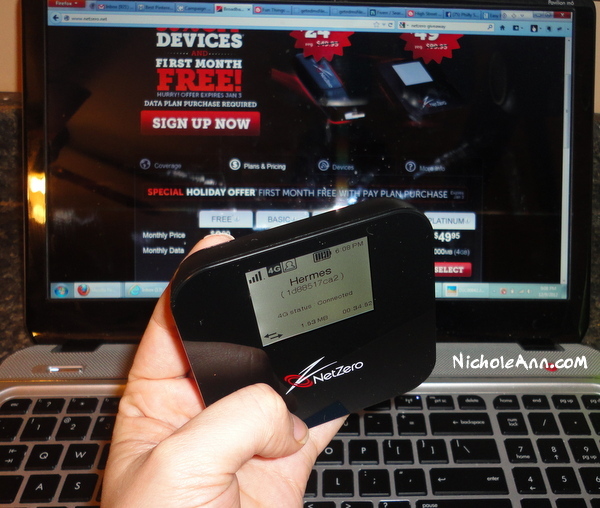 NetZero 4G HotSpot and Wireless Service – GIVEAWAY! Do you remember NetZero from back in the day? I do! My mom was all over their free dial up service back in the late 90’s. But since the dawn on Cable and FiOS connections I haven’t really thought about dial-up or NetZero and I honestly didn’t know if they still existed. Well they do, and they’ve joined 2012 in style with a new 4G wireless service. My mom passed away in ’04 but I have a feeling she’d be just as excited about this new service as I am. I’m pretty sure she would have signed up as soon as I told her about it because NetZero is staying true to their name and offering plans that start out at $0.00 per month. They pretty much have a service plan that will fit every budget and usage need. In case you are wondering what 4G is … well, think of it as broadband on-the-go. A fast wireless Internet connection that you can take with you anywhere that there is coverage. And there’s coverage across 80 cites and metro areas so there’s a nice chance that you are covered! 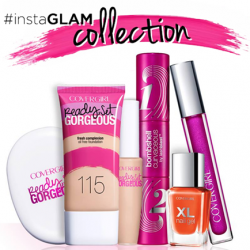 It’s small enough to conveniently fit in any bag or larger pockets so you can take it with you anywhere. The HotSpot device allows up to 8 simultaneous devices (laptops, tablets, smartphones, etc.) to connect to it. There’s also a small NetZero device call the “Stick” that looks and plugs into your laptop like a USB drive and gives it wireless Internet access. You can’t share access like you can with the HotSpot though. That is, unless you WIN YOUR OWN! Because, as the post title suggests, I do have a GIVEAWAY for you! 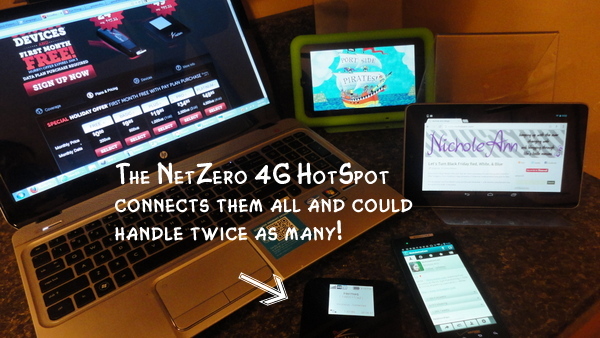 You can win your very own NetZero 4G HotSpot Device PLUS 3 free months of Platinum Service. Yep, that’s their top-of-the-line $49.99/month plan. I know Santa will be bringing lots of tablets, laptops, and smartphones to families everywhere this year. In fact, he already brought a couple of Nexus 7‘s to our house and couldn’t resist delivering them early despite my weak protests. Your family will LOVE having fast Internet access wherever they go for all their portable devices. For a chance to win, follow the directions in the form below. There are several simple ways to enter, pick whichever ones you want to do. 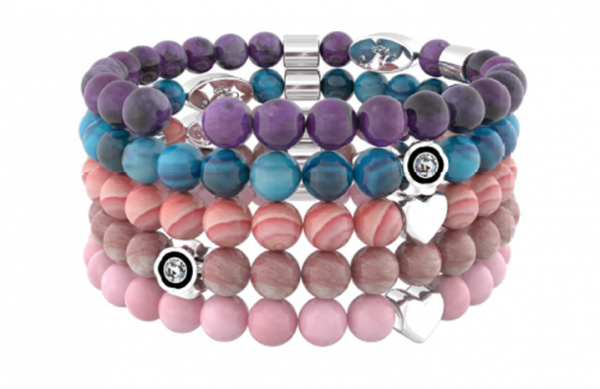 * I am being compensated by NetZero to host this Giveaway promotion. Posted on December 10, 2012 March 30, 2014 Categories Blogging & Social Media, Business, Giveaways, Product ReviewTags 4G, Giveaway, NetZero39 Comments on NetZero 4G HotSpot and Wireless Service – GIVEAWAY! Vertical Response just released an interesting infographic. They surveyed 462 small businesses on how much time and money they spend on social media activities, including finding and sharing content on popular social networks and blogging, and what tasks take the most time. Bottom line, more small businesses are catching onto social media marketing and are spending more resources on it. Forty-three percent of respondents spend six or more hours per week on social media activities for their business. Nearly half of the small businesses who blog spend up to three hours per blog post on at least a weekly basis – time that, prior to having a blog, would have been used on other business activities. Some spend even more time per post. And they should! 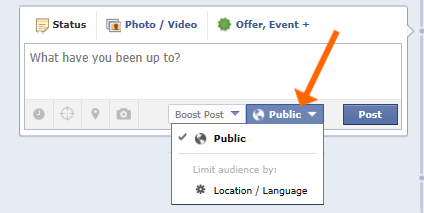 As easy it looks, a good quality post doesn’t get slapped together in a few minutes. 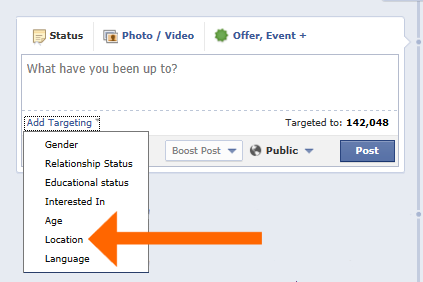 A company truly invested in social media marketing will then spend more time promoting the post that just took hours to prepare on Facebook, Twitter, Pinterest, Google Plus, etc. Small businesses are recognizing the increasing importance of generating content for social media. Of course, everything comes at a cost, whether that be time or money. 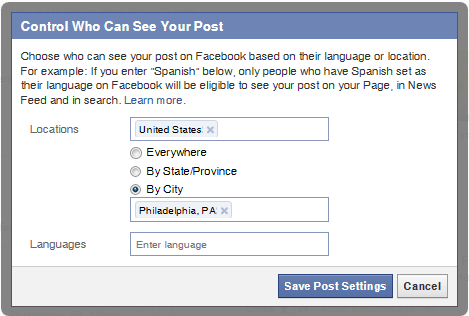 So the question now becomes how small business should spend their time and money on social media? The answer will be different for everyone. It could be a complete DIY job, hiring an employee or contractor to focus on social media, consulting with a social media expect for training, or completely outsourcing to an agency. 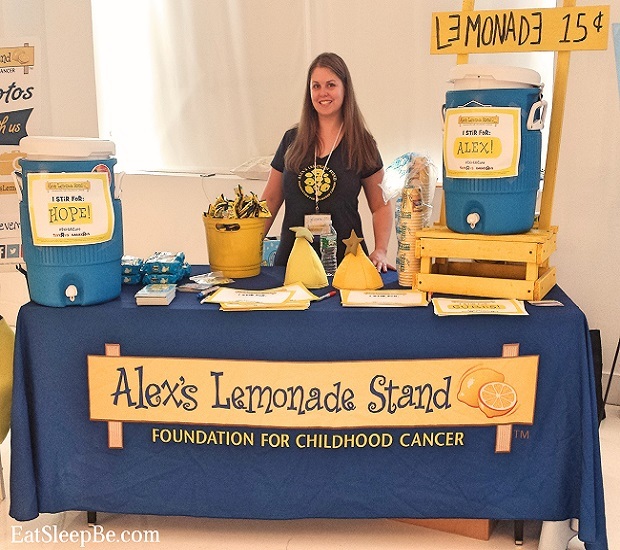 I was super thrilled to be invited to the first Blogger Beach Bash hosted at the Golden Inn in Avalon, NJ. And the reason was purely selfish. 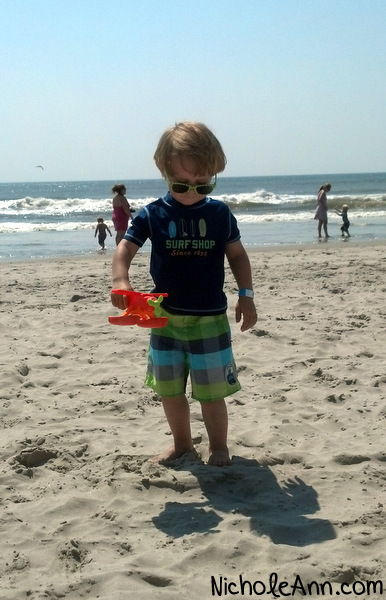 My son is 3 and I hadn’t taken him to the beach ever before. What better way to do it than with a bunch of bloggin’ friends! Unfortunately, the X-man ended up being terrified of the ocean and after the first ankle-deep wave he would have nothing to do with it. He wouldn’t even go near the wet sand. And it was H-O-T. And we traveled 2.5 hrs to get there. And I bought a swimsuit (on clearance for $50), a swim suit cover, beach towels, toys, etc. Ugh! Then he had to go potty and we had to trudge all the way back to the hotel. That’s when I started to overheat, get cranky, and was about to pack it up wondering why I wasted my time and money. Tried to call the Other Half for moral support and basically ended up yelling at him for [being a douche and] not coming. You’ve been there, right? I’m not the only one, right? Some days this mommy stuff really gets the better of me. Regrouped and cooled off in Luigi’s Pasta restaurant which is attached to the Golden Inn and served the breakfast we mostly missed earlier due to traffic. 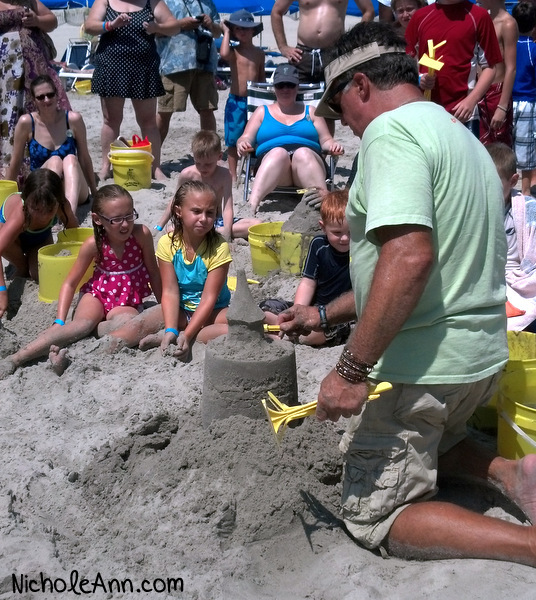 Headed back out just in time to see Sandman Matt from the Travel Channel’s hit show, Sand Masters, start his sand castle building lesson and demo. We also received The Can You Dig It Sand Tool Super Deluxe Sand Sculpting Kit . 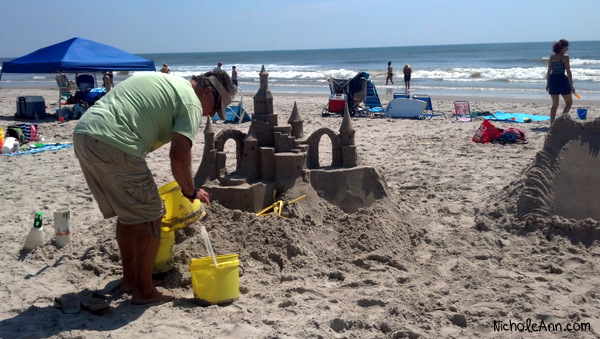 This kit has everything you need to build awesome sand castles like the masters, including an instructional DVD.The DVD might be the best part of the kit if you are sand-castle-building-clueless like I was. We’ve watched it twice. It’s cheesy but full of tips and super helpful. I can’t wait until the X-man is older and not afraid of the ocean. 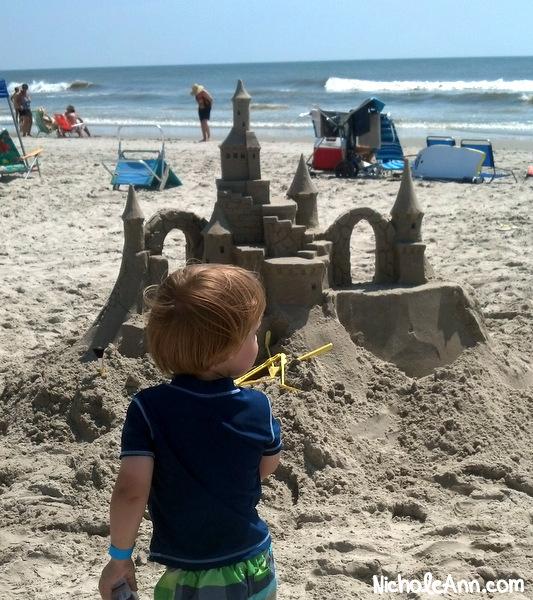 I’m imagining lots of kickass sand castle building in our future! After learning the art of sand castle making we headed back to the Golden Inn for a beach side lunch. Next was the Golden Inn’s pool area. It was X’s first time in a big pool (I know I’ve totally been depriving the poor boy). I was prepared for a big freak out and thought we’d be leaving soon because I took him to the Y a few months ago thinking we’d try swim lessons. He was terrified of the pool then. I mean shaking and grabbing on to me for dear life even though we were just taking a tour. Well, guess that’s all gone because he had NO fear and we stayed in the pool for HOURS! Seriously. I was shocked. And as a nice bonus I could actually chat with other moms for a few minutes here and there as we moved about the big pool or sat in the kiddie pool. The pool ended up being the best part of the day. Worth all the earlier stress and trouble? Except next time remind me to treat myself and stay over a night or 2. In fact, I think I need to head back to the Golden Inn for one of the Girlfriend Getaway weekends and REALLY treat myself! First time with his toes in the sand! Sand Master Matt Long at work. Learning from the expert! Sandman Matt teaches us the art of sand sculpting.